Secretropin - SRxSecretropin®, the logical first step in GH therapy. Secretropin® has been a physician only dispensed product for the past 13 years due to it's clinically documented ability to increase the production of Growth Hormone (GH) and it's growth factors (IGF-1 and IGFBP-3) by up to 650%. This was accomplished with over 1000 patient months worth of blood testing and not just 16 patients as other products may tout. 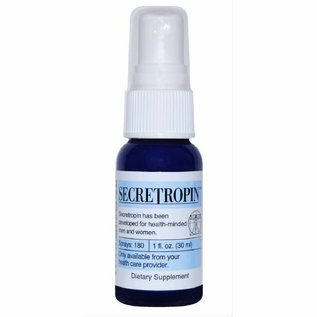 = Secretropin® achieves this ability through a number of established neurohormonal and nutritional pathways thereby acknowledging its status as a secretagogue. A secretagogue, in regards to GH, uses these pathways to increase its production and release. Since Secretropin works within the body's hormone regulatory system, over stimulation of GH production can actually lead to a transient drop in the measured production of GH, IGF-1 and BP-3. Just by lowering the dose of Secretropin this decrease can be reversed and levels can increase. See the 2013 AMMG recording on Secretagogue Education. - In the past, many individuals were using Secretropin® to maintain their own pituitary production of GH while using injectable GH (rhGH). Science has documented the drastic reduction in our own GH production (intrinsic) when injectable (extrinsic) rhGH was used. The natural recovery of pituitary GH production can take up to a year if not longer. The use of Secretropin® does not cause this if used as directed under the guidance and care of a knowledgeable physician. Developed in 2001, Secretropin(SRx), a non-peptide, amino acid based secretagogue has clinically been found to increase the production and release of GH (as measured by IGF-1 and IGFBP-3) through a number of neurochemical pathways by: suppression of Somatostatin, stimulation of GHRH, agonistic to Dopanergic and Gherlin receptors, and the non-specific Synthetic GH Receptors. Additionally, Secretropin is believed to directly stimulate pituitary Somatrophs thereby increasing the production and release of GH. Secretropin is classified as a natural food (dietary) supplement and not a drug. Secretropin does not contain any (prescription) drugs.